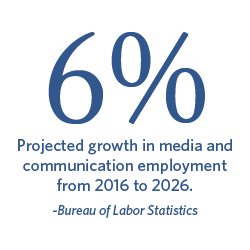 Ready to jumpstart your career as a media professional? Through Regent's combined degree program, you'll earn your Bachelor of Arts (B.A) in Political Communication with four graduate-level courses counting toward your Master of Arts (M.A.) in Government—Political Communication. Enter the master’s program with master’s credit and/or advance standing, and save money by earning two degrees more quickly! Understand the fundamentals of the American government system, political participation, public opinion and voting behavior. Craft compelling storylines and scripts and communicate persuasively. Apply graduate level course credit toward your Master of Arts (M.A.) in Government. Overview of the historical roots, methodological groundings and present state of the communication field with particular attention to its specialized vocabulary, important writers and works and significant scholarly journals. Pass/No Pass. Government majors wishing to use these courses towards advanced standing in the Robertson School of Government must achieve a B- or better. Upon completion of 75 credits, students in good standing, and based on approval, will be eligible to take COM 504 Introduction to Communications, which will be accepted in place of COMM 245 Communication Theory. In addition, also beginning in their junior year, students will be eligible to take either of the following two government courses in the Robertson School of Government: GOV 614 American Politics or GOV 625 International Relations Theory, which would satisfy GOVT 240 American Government and Politics I and GOVT 304 International Relations respectively. Following completion of the B.A. in Political Communication, students will then be admitted into the M.A. Government with a concentration in Political Communication program to fulfill all remaining M.A. in Government with a concentration in Political Communication requirements.